Finally the first poster of Sonam Kapoor, Kareena Kapoor Khan, Swara Bhaskar, and Shikha Talsania movie Veere Di Wedding has come out and it surely looks like a big fat wedding poster. 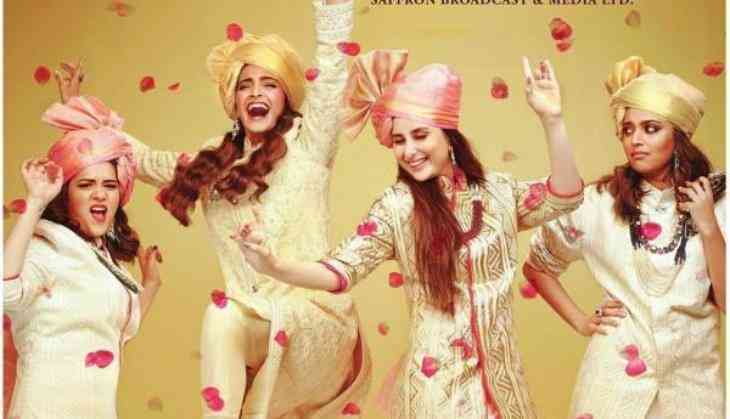 On 24 October, the makers had released the teaser poster of the film in which all the leading ladies were dressed up in bridal costumes and now the makers have turned the hat. In the first poster, Sonam Kapoor, Kareena Kapoor, Swara Bhaskar, and Shikha Talsania all can be seen as grooms in their new costumes. The first poster has also announced the release date of the film. According to the poster, the film is going to hit the screens 18th May 2018. This is to notice that this film has been in the discussions since the time it was announced. Many are saying that it is going to be the first attempt from Bollywood side to come out with a all girl gang. Hollywood always has tried their hands in taking actresses in leading roles, so now its the turn of Bollywood. Let me tell you that the film is being produced by Anil Kapoor and Ekta Kapoor's production houses. However, Anil Kapoor's younger daughter Rhea Kapoor has produced this film. This is Rhea's third venture after two successful films Khoobsurat and Aisha. Now it has to see will this film make a trend in Bollywood or not?